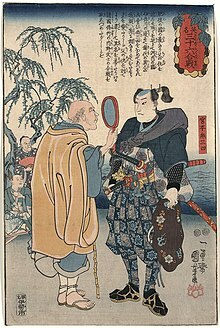 A widblock prent bi ukiyo-e master Utagawa Kuniyoshi depictin famous rōnin Miyamoto Musashi haein his fortune tauld. A rōnin (浪人, "drifter" or "wanderer") wis a samurai withoot laird or master in the feudal period (1185–1868) o Japan. ↑ "Rōnin, Japanese warrior". Encyclopædia Britannica. Retrieved 2009-08-29. This page wis last eeditit on 24 Apryle 2018, at 01:06.